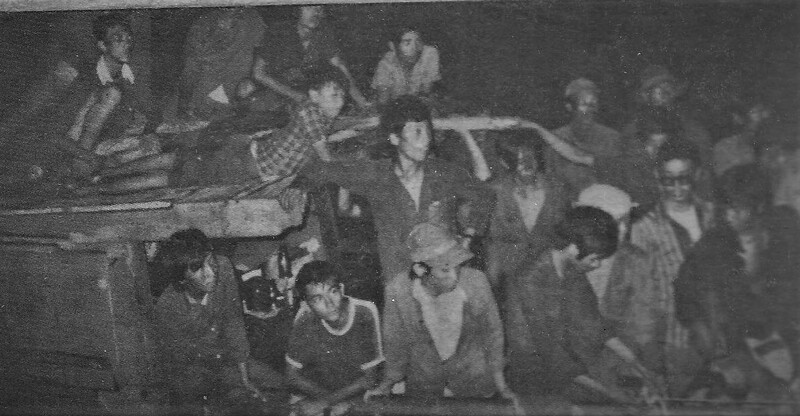 An original photo of the 85 Vietnamese refugees who were rescued by an American submarine. BVH Introductory Engineering and Integrated Math II teacher Wayne Lee is present among the refugees. A 14-year-old boy says goodbye to his mother knowing that he might never see her again, as he departs from the shores of his small village in Vietnam. The rickety wooden fishing boat is just large enough to hold the 85 refugees who are struggling to find a better life, escaping from the communist state. After what could have been days or even weeks drifting over the open ocean, someone says that they see a light in the distance. Some say that they could be reaching land. As the light gets closer, however, it seems to be underneath the water. All of a sudden, the 85 individuals aboard the rickety canoe gasp in awe as they witness a submarine emerge from the depths on the sea. Then, surprise turned into tears of joy as they noticed the American flag, to them, a symbol of freedom and liberation. They all cheered, and the 14-year-old boy rejoiced with them. They were saved. This was one of the most memorable moments for Wayne Lee, an Introductory Engineering and Integrated Math II teacher at Bonita Vista High. Long before this, however, he was a Vietnamese refugee, who left Vietnam at the age of 14 with no relatives other than his younger cousin. Lee was born in a small village near the Mekong river in southern Vietnam. Cut off from the outside world, Lee described his childhood years as peaceful, with farming a normal part in everyday life. “I spent a lot of the time out in the field growing crops, feeding livestock, and fishing, those were the main things,” Lee said. Those who lived in Lee’s village had little access to the technology of the modern world. Lee acknowledged that this was the only life that they knew. “[We] had very little. The clothing [we] had was very poor. The huts didn’t have any structure so when it rained, it flooded. Sometimes you’d even have water inside the house for a while. That’s just what was normal for [us]. It was very primitive,” Lee said. Soon, however, the peace he had known for most of his childhood was cut short. Lee lived during the Vietnam war, and he was forced to leave as the conflict approached his small village. “As the war came close [the South Vietnamese army] wanted us to evacuate the village so that we wouldn’t be casualties,” Lee said. The evacuation was short and Lee soon returned to the village about a week later. However, Lee’s mother wanted him to live a new life. “My mom told me ‘If you’re here there’s not much for you.’ She was the one who made the decision, more than I did,” Lee said. Unfortunately, Lee’s mother could just afford to send only him away. She had to pay for someone to construct the boat that sent the 85 refugees off the shores of Vung Tau, a port city in Vietnam. With little time for farewells, 14-year-old Lee embarked on a journey into what was the unknown, thinking about whether he will ever see his mother again. “I remember that she had to give me a farewell and she left me there,” Lee said. Although his parents weren’t there with him, he was accompanied by his little cousin named Thien Nguyen. Nguyen is Lee’s cousin on his mother’s side. Being young, they both did not know what to expect but shared the same goal: to get to the United States. “I wasn’t old enough to know how to be afraid. I only knew that I was trying to escape Vietnam and trying to go to America,” Nguyen said. Lee explains that he did not know what was going to happen to them as they drifted through the vast sea. Eventually, however, they were scouted by the American submarine, saving them from the capsizing fishing boat. “We saw the light coming toward us, and we thought we were heading toward an island. So we changed course and the light kept coming closer and closer; then the water splashed and I didn’t even know submarines popped out of the water. At the time, I had never seen a submarine before. We then saw an American flag and everybody was really happy and joyful,” Lee said, smiling. After Lee’s boat was scouted, they were pulled onto the deck of the submarine. An oil freight ship was then called to pick them up from the deck. After boarding the ship, they headed to Singapore, where a United Nations refugee camp was located. For the next 3 months, Lee stayed at two different camps overseen by the United Nations. This was also where Lee filled out his paperwork to gain entry to the United States. Lee also registered under a foster family in Peoria, Illinois. “I didn’t know a whole lot, but it was straightforward. The workers at the refugee camp would ask about my family and other simple questions, and being [as] young [as I was] it was much easier to get processed,” Lee said. Finally, the time arrived and Lee flew on a plane from Singapore to San Francisco, California. Lee recalled that the weather change surprised him. “In Singapore, it was hot, humid and tropical. Over there in San Francisco, it was really cool and refreshing,” Lee said. Then, from San Francisco, Lee flew into Peoria, Illinois where he met his first foster family. Lee remembers how his first time in an American home impacted him. “They had a two-story home and it had quite a lot of room compared to what I used to have,” Lee said. However, Lee was only with that foster family for two-and-a-half years. Lee stated that there was not a personal connection between him and his first foster parents. “I was going to call them mom or dad and they were like ‘Call me by my name!’ I didn’t know how to establish a close relationship with them, like a parental connection. I didn’t quite have that. In Vietnam, you don’t call older people by [their] name, so there was a bit of a culture shock,” Lee said. In total, Lee stayed with three different foster families. Lee explained that the second foster family he stayed with adopted too many kids, and they weren’t mindful of his academic studies. He finally settled in with a Vietnamese family with whom he finished high school, as they gave him that personal connection that he had been longing for. “My final family was a Vietnamese family that took me in and I was able to finish high school. Culturally, I was able to relate to them and they understood my intentions,” Lee said. While in America, Lee continued his schooling by attending a local high school in Illinois. Lee described himself as “very ambitious” and he graduated in the top three of his class. However, Lee had his reasons for his determined nature. “I knew I had no family members and the only ticket to get into college was a scholarship because no one would pay for me. I was very focused on getting my grades up,” Lee said. Lee went to the University of Illinois to study mechanical engineering, where he met up with his original foster parents who were still professors at the time. However, in his third year of college, Lee decided that he wanted to join the military. “After the submarine picked us up that one day, I felt a sense of obligation or debt to this country. To serve,” Lee said. Lee served in the military for 28 years. During his time on duty, he fought in Afghanistan, Qatar and the Iraq war. Lee found it to be a blessing that, as he participated in wars, he was surrounded by people he could relate to, concerning what they have experienced, taking him back to the war that caused him to flee his home country. In 2000, Lee went back to visit his old village and realized how fortunate he was compared to some of his friends who stayed behind in Vietnam. “We were the same age and the conditions they went through were so much more different than what I had to go through. It was a struggle for them,” Lee said. However, the conditions of his village are improving, which he notes is a good sign. “The roads used to be mud but now they have concrete. They can actually drive a car into the town. Before when it was mud, you could only ride bicycles. It was very difficult but now, certainly, the conditions got better,” Lee said. “There was a distinct connection at the airport. I can’t describe how it felt to see someone after that long. It was something more powerful than joy,” Lee said. About 18 years later, Lee was also reunited with Nguyen, when Lee was stationed in San Diego. Lee stated that he owes his success to his roots. With each passing day, he lives life from a perspective that has been hardened from his difficult journey. He acknowledges that he would have never imagined that he would be where he’s at today as the innocent 14-year-old boy he once was. “It’s good, it’s a blessing, but I always go back to the roots: living a humble life and having humble beginnings,” Lee said. Lee hopes that his story will serve as evidence that anyone can achieve success, regardless of where they come from. “Believe in yourself, that anything is possible. For me, I didn’t have much growing up but I was able to get where I am today, very successful life in America, serving in the military, and transitioning to teaching. I’m very passionate and thankful for what I have here,” Lee said.